Recent issues of the Devil’s Artisan are available digitally directly from our own proprietory eBook store in PDF format. The magazine is also available digitally through Magzter for various devices, including Android, Apple, Kindle and Windows. Keep reading for more information about the contents of this issue and for a photograph of Coach House’s fiftieth anniversary wayzgoose celebration. DA 77 (Fall 2015) looks back at an underreported slice of the complex history of one of Canada’s most celebrated small, literary publishers, and particularly the impact of changing technologies on book design and production at the shop on bpNichol Lane in the shadow of Rochdale College in Toronto. Included are curator Dennis Reid’s reminiscences of ‘The Old Coach House Days’ (1964—66); Simon Fraser professor John Maxwell’s investigation into early methods of digital printing at the press in the 1970s; and a short corporate history as well as a more personal recollection of several (unsuccessful) attempts to gain employment at Coach House, by Porcupine’s Quill publisher Tim Inkster. Sandra Traversy contributes a photo essay documenting the Heidelberg KORD and David Slocombe looks at the origins of SoftQuad, a spin-off company founded to improve automated typesetting at Coach House. Also in this issue, Arthur M. Smith contributes a descriptive inventory of the illuminated manuscripts of Toronto-based artist, lithographer and designer Alfred H. Howard. Recurring features include the Rogues’ Gallery, featuring a profile of Massey College Printer Nelson Adams and Richard Kegler’s discussion of the Curwen Poster Type. 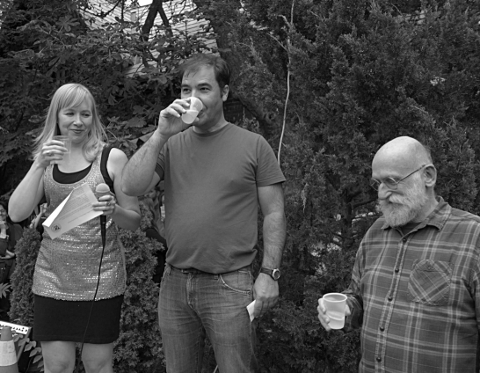 Kandid Kamera captures the Wayzgoose celebration at the Coach House on bpNichol Lane on the occasion of their fiftieth anniversary, August 27, 2015. The cover image is adapted from the cover of Robert Fones’s Anthropomorphiks(1971). The Can-D-Man logo is used with the permission of Scott-Bathgate Ltd. (Winnipeg). The keepsake image is a photograph taken by Stan Bevington of the original Coach House premises off Bathurst Street (1965). Alana Wilcox, John DeJesus and Stan Bevington raise a glass to toast the first fifty years of Coach House. Credit: Don McLeod.